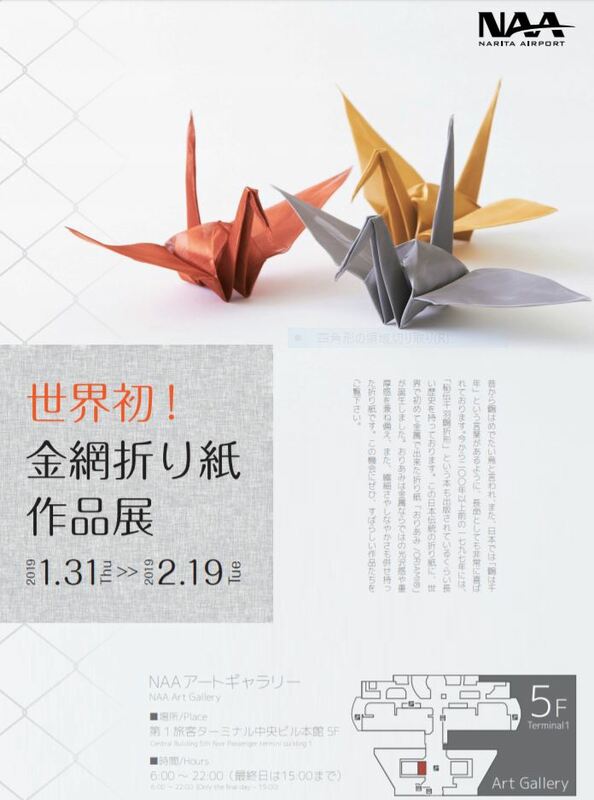 Thursday, January 31st-Tuesday, February 19th Work Exhibition of Wire Mesh Origami [Fabric Metals ORIAMI] is scheduled at the NAA Art Gallery of Narita Airport. 2019.01.23 Thursday, January 31st-Tuesday, February 19th Work Exhibition of Wire Mesh Origami [Fabric Metals ORIAMI] is scheduled at the NAA Art Gallery of Narita Airport. Between Thursday, January 31st, 2019 and Tuesday, February 19th, 2019, "World Premier! Work Exhibition of Wire Netting Origami" is scheduled at the NAA Art Gallery of Narita Airport. Traditional origami works as well as works of kirigami artists are exhibited. "ORIAMI" is suitable in producing these works as it is flexible, durable and emits splendor. You will be able to take a look at the attractive material of "ORIAMI" and a number of works made by the artists. It is held on the 5th floor of the Central Building, Passenger Terminal 1, Narita Airport. Please come and enjoy the attractiveness of "ORIAMI" and beautiful works of the artists. ■ Overview of "World Premier! Work Exhibition of Wire Netting Origami"